The tides in casting Norma are gradually changing. If one looks at trends in the last 40 or so years, the most successful Normas are mainly those who’ve made not just bel canto, but Bellini as a mainstay in their repertoire. The majority of the dramatic sopranos still attempting the role have been met with a poor reception. Yet “tradition,” of casting large-voiced dramatics with minimal skills in florid song, still prevails. I’d like to see that end. There has only been one true, rare soprano dramatico d’agilita, so far as I have been able to find in the last 40 years, who has demonstrated success in doing the score in all its original keys (including Casta diva in G, which is, according to the key structure of the scene, the right key), properly ornamented, and with the requisite flow of line and agility: Barbara Quintiliani, in her accounts of the role on YouTube (what is astonishing is that it was her first and only performance of the role, yet it sounds wholly arrived and finished). The compromises made on the score are of long-standing, and go beyond the wrong voices singing the role. Cuts, transpositions, and lack of proper ornamentation are routine practices. Norma, apart from a mere few descents into the lower register, is a high-lying role, with several high Cs and passagework requiring ease and freedom around the top, and above the staff. It is a role calling for a well-trained florid-based technique, and one that can use that to expressive ends within the compass of the music. The score, and not an antiquated tradition should rule as a guide to how it should be sung. The reasons I outlined above is why I found Gruberova’s Norma to be a revelation. Indeed, this is the performance that I find myself going back to more than any other of hers. For me, it is the logical culmination of her dedication to essaying the prime bel canto roles, the pinnacle of her significant gallery of portrayals. At 59 here, Gruberova is caught right in the late-summer of her prime, and she is in astoundingly good voice. The basic timbre is intact, but slightly darker; the legato and agility are still in prime estate, no wobble, and an absence of a scratchy, “old-lady” sound. What registers most strongly here to me, with how familiar I am with her art and singing, is how much preparation Gruberova put into the role. Vocally and dramatically, every phrase is given a vital sense of its importance, both as individual entities, and into the collective whole of the performance. Love of this role, and the music constantly shows; nothing is shrugged of, or allowed to pass with vagueness. 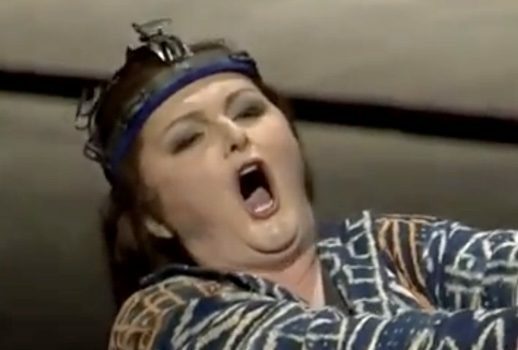 In the high-coloratura realm, Gruberova has a larger, more substantial voice, and can sing powerfully on high, but a strong chest register has never been hers. In those few, crucial, low-lying phrases throughout, she does not try to force what she does not have, but gamely gives her best, and compensates by accenting – in what the Italians call l’accento – and articulating the words forcefully. On the other hand, the role’s more frequent extensions into the upper register are handled with an ease, freedom, and expansion that few dramatic sopranos can manage. There are numerous high Cs throughout, loud and soft, plus all the passages that require filigree legato, and a certain pliancy. Here is where Gruberova scores, shaping Bellini’s lines eloquently, infusing them with dynamic vividness. Moreover, the scrupulous, accurate traversal of the score is a rarely-encountered phenomenon. Dramatically, Gruberova portrays Norma as a deeply troubled woman, in constant turmoil, torn between loyalty to her country, her broken vows, and the discovery of Adalgisa and Pollione’s treachery. This portrayal is more the woman than the warrior, and you see that Norma’s personal feelings are what cause her downfall: this aspect is played up very strongly. You see that this Norma is exhausted, strained in spirit, and constantly preoccupied with her dilemmas. “Sediziose voci” – at 25:30. Coming up from below her subterranean dwelling, Gruberova’s authoritative stride and stance command the stage. This crucial opening flashes out with fire, rhythmical impetus and vigor; what may surprise is the fullness of the attack on the middle voice, and a welcome thrust; witness`e infranta cada,’ and “Qual consunta morra.” This is an uncommonly fine account, nuanced, suspenseful, and imbued with a theatrical sense of drama. “Casta diva” – at 30:47. Sung in G, it is fluid, silvery, and elegantly delivered, with the import of the text made manifest. The ascent to the repeated Bs, up to the C, done on the word ‘sembiante’ in the score, and not dropped for ‘ah,’ soars, and sails out with ease. The second verse, “Tempra o diva” is sung even more quietly, with a hushed, beautifully poised stillness. Gruberova takes the “regnar” up, sweetly intoned, a textual variation that Rosa Raisa once incorporated. The close of the aria is sweepingly done, gorgeously tapered. “Ah, bello a me ritorna” – at 38:57. Perhaps the best acted and sung of any I’ve seen and heard. Gruberova does not merely stand and deliver this rather conventional cabaletta as a rushed, trumpeting afterthought. She acts out the meaning of the text physically, facially and vocally – it is an aside for Norma, describing her pulsing excitement, joy and conflict at recalling Pollione’s love. Gruberova sings on mainly all the consonants and different vowels as it is written in the score, a much more difficult thing to do. As a result it sounds less rattly and more precisely defined; one cannot sing words into scales and insert the “ha’s” without distorting the line. Therefore, the divisions sound less choppy. As per Bellini’s score, it is the most accurately sung and finished rendition of this cabaletta to be had. At 59:12, in the scene with Clotilde, in which Norma expresses conflict regarding her children, Gruberova is effectively tormented, riddled with doubts, fears, and anguish; we’re getting of what’s at stake in Norma’s troubled lot. “Il troppo tormentoso” has the requisite foreboding and gloominess. Following that, the first duet with Adalgisa, here played by Sonia Ganassi, is marvelously acted and sung by both (Ganassi’s “Sola, furtiva al tempio” is pure vocal gold). They’re interacting conscientiously here, and reacting to each other’s statements. Their duetting is splendid; timbres and approaches match, and they trace the lines with musicality, fluency and skill. Both voices are of a flawless, slender-of-tone purity. These two communicate thoughts, words, and feelings, physically and vocally, not just idiotically standing there facing the audience. Gruberova can make even a passing line like “t’ascolto” memorable and implicit of meaning. When Adalgisa tells Norma that her mysterious lover is from the enemy faction, Gruberova’s expression of horror at “Roma!” and then, “Ei, Pollione!” is vividly put across. The finale to Act One – where you see all the principals in a mess of confusion and shock; Gruberova’s “O non tremare” is sung with agile gusto, her imprecations against Pollione and Adalgisa towering in its fury, and she finishes off the act with a soaring high D, without dropping out for preparation. The drama here sizzles with febrile, charged excitement. The opening of Act Two, at 1:26:22, is broodingly atmospheric, and Gruberova effectively depicts Norma’s desolation, pacing around aimlessly, deeply troubled. “Dormono entrambi,” vocally, and physically portrayed, is pensive, internal, and reflective. “Teneri figli” is long-lined, expressive, and the moment of the near-stabbing of her children is gripping. The second-act duet, “Deh con te…Mira o Norma” is, like the earlier one, done with conviction and skill, and the conflict between the two friends is put across quite effectively here. At 1:37:16, Gruberova intones “Pei figli suoi, pei figli suoi t’imploro” in the most pleading and pathetic of accents, and showing how the precise “turn” in the E-G-F notes on “figli” can be used as a figure of emotive expression. Plus: what a joy it is to hear the elegiac lines in this three-part duet delineated with such graceful elegance. “Ei, tornera,” at 1:58:08, is accomplished, both in its mood of temporary jubilation, and vocally, where the tricky a piacere “amore,” going up to a high C, is deftly, expressively handled, finely spun, on one breath. The “scorreran torrenti,” on to the declarations of “Guerra! Strage! Sterminio!” ring out with remarkable power. “In mia man,” at 2:07:38, is Gruberova’s heaviest challenge in the score. Lacking ideal heft in the lower regions of here voice, she nevertheless is helped by the staging, and her grave articulation of the text – once again, by the application of “l’accento.” Here you will observe Gruberova’s smart, intelligent handling of the scene’s requirements. What she slightly lacks by nature in heft she makes up for by art. She does not shirk from giving her all in conveying the tension through judicious intoning and weighing of the text; it is skillfully paced, and the drama of her dangerous conflict with Pollione (Zoran Todorovich, here strong and involved), is artfully handled. “Solo! Tutti. I Romani a cento a cento” is flung out with energetic, fluent gusto, and the tension of the scene is sustained to its agitated conclusion. It is the point of “Son io,” at 2:15:46 on, that reveals Gruberova’s skills as a tragedienne. Brian Large is the video director, and he keeps the camera mainly on Gruberova’s face. When she confesses, you see a kind of astonished shock immediately following the words. Norma immediately takes off her ceremonial robe, crown and knife (which, like a warrior, she has in her hands constantly throughout the performance), and lays it on the floor. The memory that has lingered strongest is at the point of “Norma non mente.” Looking like a veteran classical actress, you see in Gruberova’s large, hurt-stung eyes, burning in an implicit combination of relief, exhaustion, shame, penitence and humility, while she intones the words, heavy in irony and remorse. From “Qual cor tradisti” to “Deh! non volerli vittime” to the end of the opera, Gruberova scales near-Olympian heights of pathos and tragedy. Singing in the most penitent and poignant accents of tone, Gruberova makes Norma’s absolution and sacrifice believable. “Ah! padre! ah! padre..un lasciami…un prego ancor” is pleading, heartfelt and humbly noble. The high B, sweet rather than throttled, in the climactic phrase “di lor pieta” is superbly controlled, with a forlorn, imploring expression of appealing for mercy and forgiveness. The closing moments, at “Padre tu piangi,” when that haunting modulation of E minor to E major occurs, is devastatingly moving. Space prevents me from going into detail about the production, which was designed and directed by Jürgen Rose. It is definitely of the updated “Regietheater” school, but it works on its own terms as compelling drama. As with David McVicar’s production at the Metropolitan Opera, I am optimistic that Norma being staged as a static, one-woman show of the principals standing around inertly, is coming to an end. Rose has directed this with unerring focus on the human, interpersonal relationships in the triangle drama, playing up the varied, and troubled emotions of the characters. Friedrich Haider, the conductor, gives a sensitive, yet highly dramatic account of the score, assisting his singers with astute care. Drawing this series of 50th anniversary tributes to a close, this performance, to my mind, is a fitting conclusion. I regard it as a magnum opus of her long association in bel canto. Part One of this discussion.